This simply scrumptious summer salad reminded me of the summer meals of my youth, helping my dad grill up some burgers or steaks while setting the table on the patio and laying out the platters and bowls of fresh veggies from my mother’s garden. Many of those dishes featured her green beans, which she plucked from carefully tended vines in the plot across from the house. 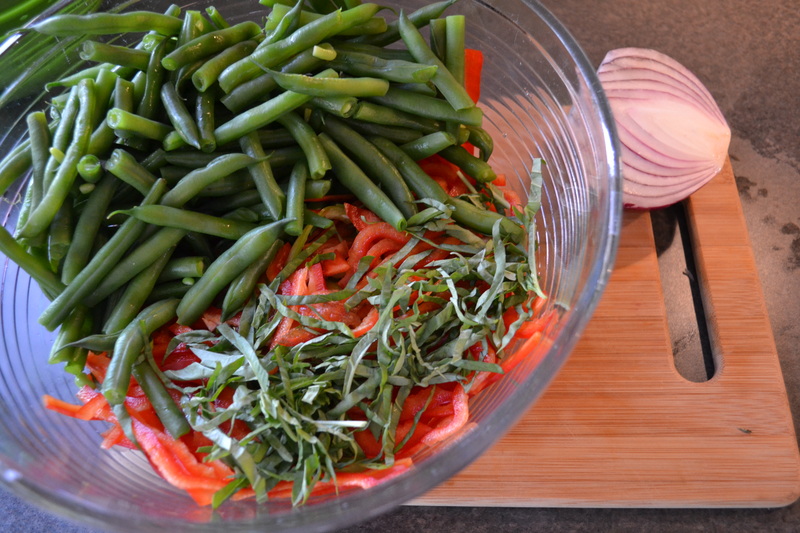 While I’m not a gardener, fresh produce isn’t hard to come by during such a lovely summer, so given the opportunity, I picked up a large helping of fresh green beans with the intention of creating a simple salad like mom used to make. Begin by slicing the onion very thin and soaking the slices in the vinegar and olive oil. I like to add a little salt and pepper as well at this stage. By soaking the onions first (for 10-15 minutes on their own), you can impart massive flavor while simultaneously removing the “oniony” bite. This works well for us, considering I LOVE raw onions, but my wife isn’t a fan of the pungent, acrid (“oniony”) flavor inherent therein. As the onions are soaking, bring a pot of salted water to a boil, and cook green beans: drop split beans in boiling water for 4 minutes. Strain and rinse. Toss all ingredients together just before serving.